Skiddaw Little Man. Captured on the RX10. I finally managed to get out with the RX10 at the weekend and the weather was only dreadful rather than delivering destruction on biblical proportions (although some parts of the UK continue to be battered by storms). Despite the poor conditions I was able to capture a few images where the operation of the RX10 impressed me. 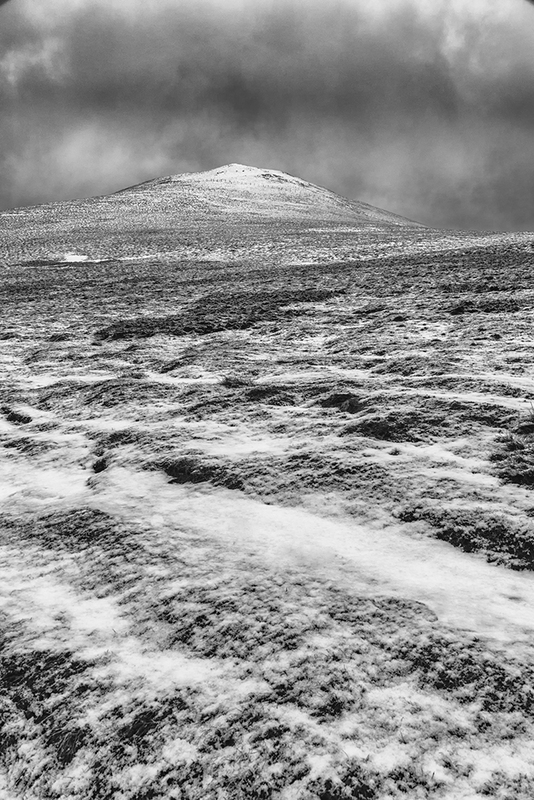 The image above is of Skiddaw Little man which is one of the peaks on the Skiddaw massif. 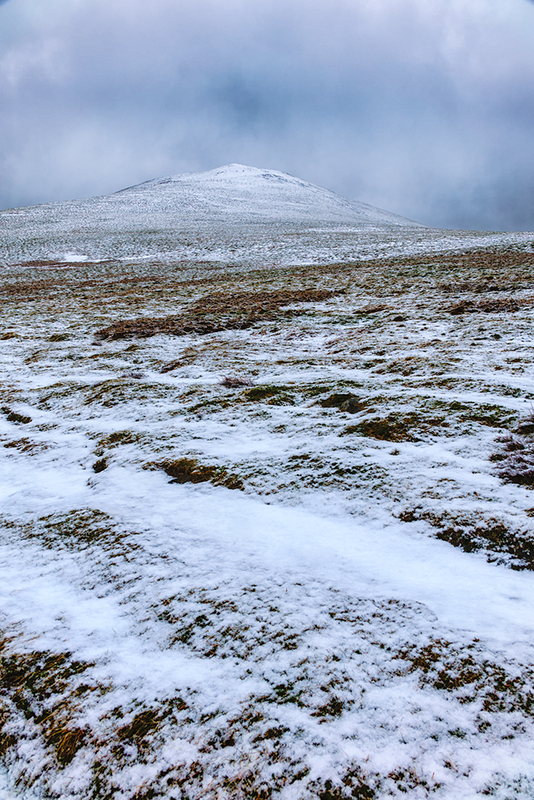 On this particular day we had ascended Skiddaw Little Man on the way to the main summit of Skiddaw. The snowline kicked in at around 700m and visibility was down to around 20m for most of the day. It was only on the descent that there was sufficient break in the cloud to reveal this peak. 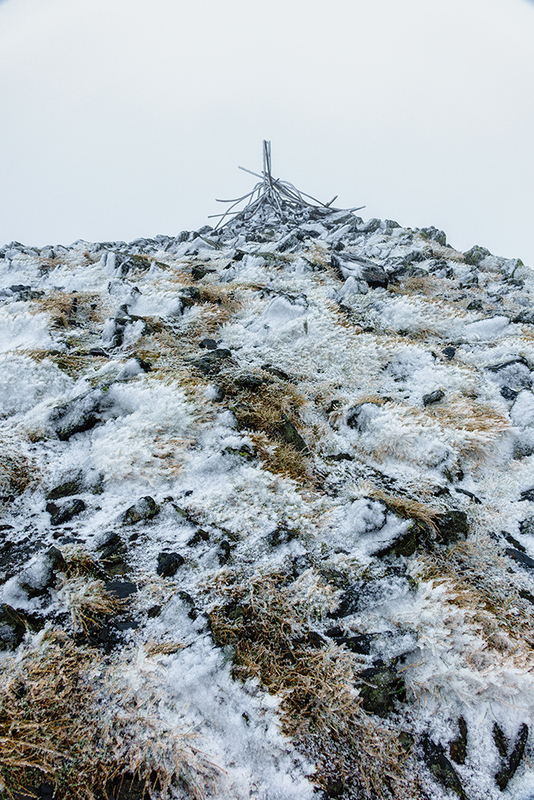 Below you can see a shot of the pile of rocks and twisted iron at the summit. 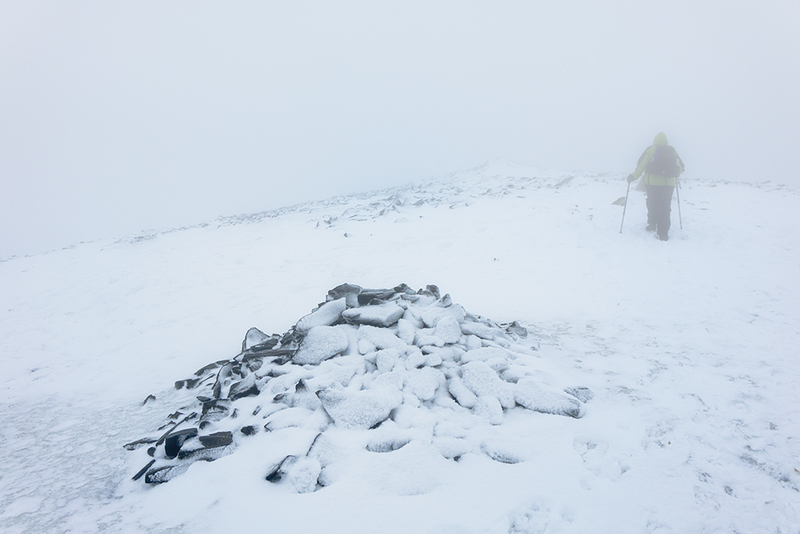 The other aspect of the weather conditions that can’t be seen from these images was the strong and very cold wind. I had removed my right glove for no more than 2 minutes to take one shot and later, once I had descended it became very painful. It wasn’t until the next day that it stopped hurting and I can still feel it even today. Despite all this I was able to take some OK shots with the RX10. The controls were quite easy to use through my gloves (I became a little more careful after the experience above). I found the DMF switch on the camera which activated the focus peaking. For those of you not familiar, this shows where the image is in focus, allowing you to set the correct aperture and focus point. This was great as I found I needed to adjust my usual approach to selecting the point of focus. I was also able to use the camera with a slightly wider aperture, which helped the quality. In my previous post I mentioned the problem with the writing on the front of the lens reflecting on my filters. My solution was to use 3mm white board dividing tape to cover the writing and this proved very effective. If you find you have a similar problem get some black tape. The quality of the image produced is very good and the lens appears very sharp at all apertures, although around f/4.0 it was particularly impressive. Yes the corners do go off slightly when at 24mm but nothing like as much as the NEX5 that I used to have. Image quality appeared good across all the focal lengths from 24-200mm but I really need some decent conditions to assess this properly. The EVF was superb and the image quality matches that of an optical viewfinder. The only niggle I had with it was when it misted up due to the changing temperatures when I kept putting it in my backpack. The misting caused the screen on the rear to switch off as the sensor in the EVF determined the mist was my eye. You can of course override this. Checking the camera menu before taking it out I had identified that all the buttons can be reassigned. This allowed me to configure it to work in the way I wanted. For example if I now press the centre button within the control wheel I can activate the flexible focus spot and then use the control wheel to position it. Turning the control wheel allows me to set the ISO. This is great and avoids needing to go through the Function button. These may sound like small features but it means you can set the camera up just as you want, making it much easier to use. Overall I really enjoyed using the camera. It really does feel like it’s one of those great cameras that will pretty much handle anything you throw at it. I will continue to post more thoughts as I use this camera more. And for fans of B&W, here is the first image processed in Nik Silver Efex. Thanks. I think the subtext to the image should read few are daft enough.